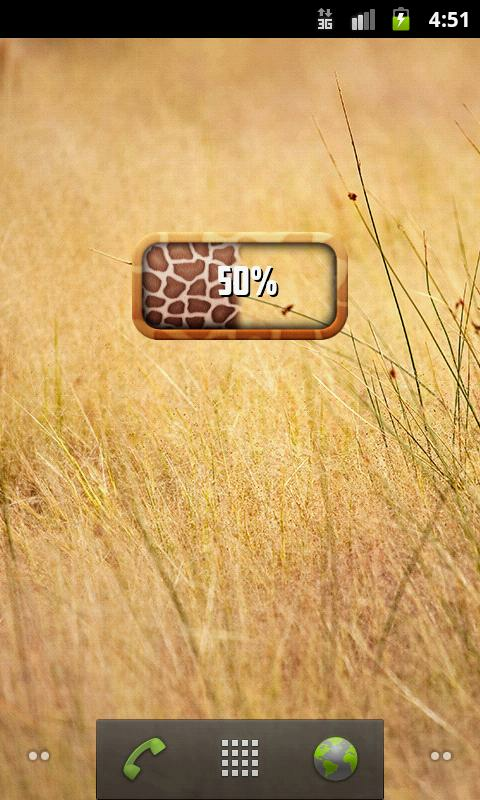 Today we are presenting you our new battery widget. It's agiraffeskin inside a cool border which shows you your currentbatterylevel. 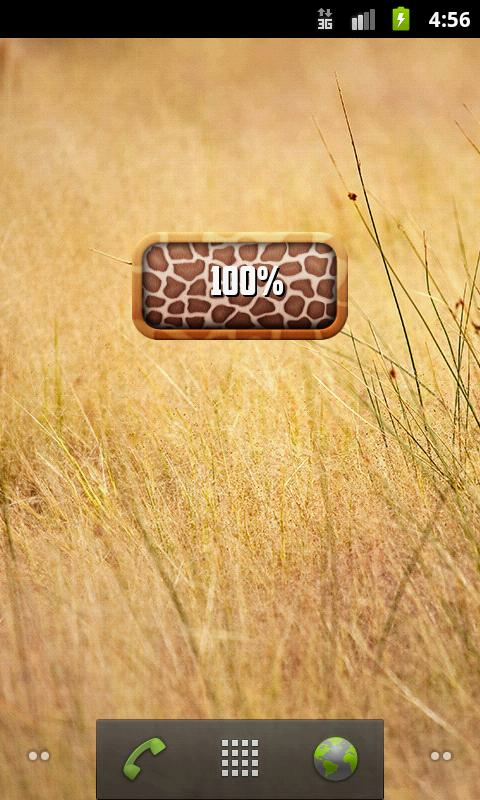 If you like wildness, nature, animals such asgiantgiraffes, savanna, Africa, sun or hot, download it now! We hope you'll like it and appreciate our work. 1. Go to the desktop. 2. Touch the screen anywhere and hold it until a new windowshowsup. 3. Select "Widgets" and find this one! Are you bored of your normal battery? Checkout our new Mobbo Weed Battery widget! A ganja-smoking creaturecalled Mobbo gets as high as your battery level is!Features:-precisely tells your current battery level,-gives you additional informations about your battery like voltage,temperature, status and type,-100% free! !How to run the widget:1. Go to the desktop.2. Touch the screen anywhere and hold it until a new window showsup.3. Select "Widgets" and find this one!That's all! Are you bored of your normal battery? Checkout our new Elixir Battery widget! The mysterious, green elixirwill tell you the current state of your battery. The less you cansee, the lower your state is. And if you can't see the elixir inthe bottle at all, it's the highest time to charge! !How to run the widget:1. Go to the desktop.2. Touch the screen anywhere and hold it until a new windows showsup.3. Select "Widgets" and find this one!That's all! Are you bored of your normal battery? Checkoutour new Joint Battery Widget! It burns down as your batterydrains!If you like ganja and marijuana, then this widget isperfect foryou!Features:-precisely tells your current battery level,-gives you additional informations about your battery likevoltage,temperature, status and type,-100% free! !How to run the widget:1. Go to the desktop.2. Touch the screen anywhere and hold it until a new windowshowsup.3. Select "Widgets" and find this one!That's all! Are you bored of your normal battery? Checkout our new High Emoticon Battery widget! The smiley emoticon alsolikes to smoke some weed from time to time and you can see it inits eyes ;) This ganja lover will inform you about your currentbattery level and will get more high with each percent of yourbattery!Features:-precisely tells your current battery level,-gives you additional informations about your battery like voltage,temperature, status and type,-100% free! !How to run the widget:1. Go to the desktop.2. Touch the screen anywhere and hold it until a new window showsup.3. Select "Widgets" and find this one!That's all! Are you looking for something stylish? Try outthis lipstick battery widget! 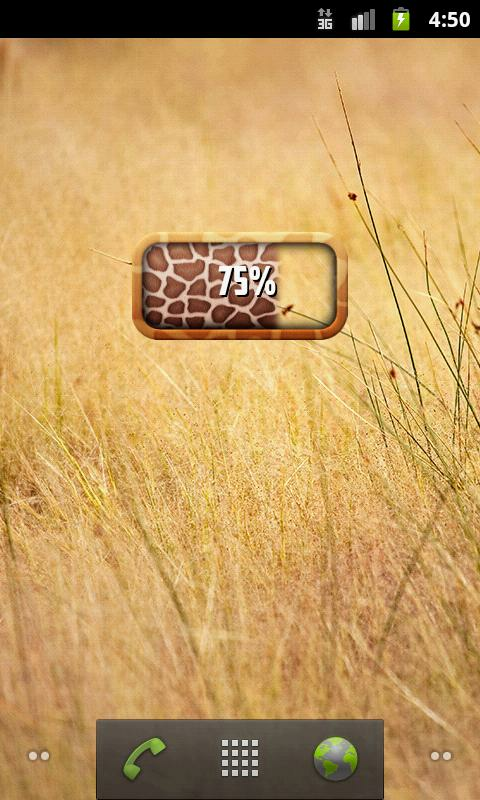 It looks like a lipstick which getsmore used while your battery state is getting lower!How to run the widget:1. Go to the desktop.2. Touch the screen anywhere and hold it until a new windows showsup.3. Select "Widgets" and find this one!That's all! application shows percentage of battery life. charge batterypercentage display. battery charge indication for android. batterylevel display in status bar. see which hardware components thatprevent fast charging. like: GPS, WiFi and cellular internet data.- display color of the battery according to its percentages. -lightning icon appears when it is charging. - details like:temperature. volt. capacity. last electricity charge time. - usefor free! Crystal sphere is a battery of simple widgets(1x1, 2x2 size). Will change to green in various colors such asyellow, from green to blue depending on the amount remaining fromthe battery.Is a simple widget, the screen is more beautiful Sumaho by simplyputting the home screen, it will look lovely.